1. In the fall of 1988, I paid fifty cents to murder the Boy Wonder. My family was living at Yale Divinity School. Four of us cramped together in a small dorm, littered with toys, action figures, trading cards, and my Dad’s religious textbooks. I no longer remember how I first got the Batman comic that changed my life, the issue with the advertisement that read, “Robin will die because the Joker wants Revenge, but you can prevent it with a telephone call.” My guess is my dad bought it for me to keep me occupied while he was studying, but I might have acquired a few issues through a trade or swap with Casey, an eight-year-old troublemaker who lived in the same dorm. After seeing the advertisement I became obsessed with calling the 900 number. I think I lied to my parents so they’d let me make the call. When the eleven thousand votes were counted, there were 5, 343 votes for Jason to die and 5,271 for him to live. If I had known the horror that Robin would go through at the hands of the Joker, and the sense of guilt I would experience due to his death, I would have cast my ballot differently. 2. I was six. Casey and I were superheroes sneaking on to roofs to get a bird’s eye view of the campus, our Gotham City. We spent afternoons navigating canopies and parapets, spying on students and faculty. Jordie, a strange kid who always dressed in green tights and believed he was Robin Hood, sometimes came along on our adventures. He was a forager, before we knew what a forager was, eating everything, grass, branches, crabapples, unripe berries. We were a superhero team. At eight Casey was the oldest and wisest and therefore Batman, I was Robin, though I didn’t realize it at the time, and Jordie was Green Arrow or Green Lantern, any superhero who was Green. This was the same year my first girlfriend, Isabelle, told me she could fly, and I believed her. 3. In Batman 427, the Joker kidnaps Robin and brutally beats him senseless with a crowbar. He then rigs the room with dynamite. Kathoom! Jason is caught in the explosion. 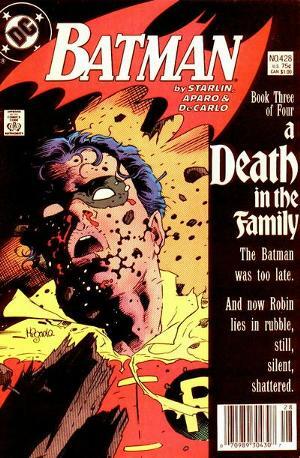 At the end of the issue the readers were informed that they had a choice whether Robin lived or died. Readers had only 36 hours to act. The writer, Jim Starlin, wrote two versions of the comic depending on the verdict. The cover of the next issue read, “The Batman was too late, and now Robin lies in rubble, still silent, shattered, can he possibly be alive?” I joined the crowd calling for his death. 4. For over twenty-five years, comics have given me something to look forward to and anticipate, an escape from the rest of my life. I might lose interest for a few months or a year but I will always come back with the same enthusiasm and the sense of wonder of a six-year-old kid. I still revisit comics I bought twenty years ago, which I keep in Mylar bags entombed in heavy long boxes. Every time I open the plastic sleeve I’m reminded of different times in my life, the way a good song brings back memories. As I flip through Batman and Robin 8, I recall the desperation and the sense of helplessness I felt the day I broke up with my girlfriend. It was 2009, I was twenty-seven, trapped in a strange parallel universe where I somehow reacquainted with my childhood sweetheart and moved 3500 miles from Anchorage, Alaska to Chicago to be with her. When we broke up, I booked a ticket home on my computer in her living room and read Batman and Robin 8 while she assembled a piece of furniture in her bedroom. 5. The same year that Robin died we moved to Omaha, Nebraska. Soon afterwards, my Dad took me to Dragon’s Lair, my first real comic store experience. Inside were racks of new comics, role playing games, arcade machines, posters, playing cards. Valuable comics were enshrined on the walls like paintings at a museum. I used to spend my five dollar allowance each week searching through the quarter bins for cheap Wolverine comics or purchasing new issues of Batman and X-Men. My Dad always slipped me a few extra bucks, especially if it was something he wanted to read. Every morning he read Comic Shop News with his breakfast instead of a normal newspaper. It was a great time for comics. One year earlier, Frank Miller’s Dark Knight Returns, Alan Moore’s Watchmen, and Art Spiegleman’s Maus had been released to critical success. American comics were finally growing up. 6. Around this time, I started listening to my father’s old pulp radio broadcasts of The Shadow and The Green Hornet. I would close my eyes and let my imagination recreate what I was hearing. Sometimes I would try to draw what I was listening to. In school, I would create my own comic characters: the super villain Eight Ball, who threw exploding pool balls at his victims, or the hovering hero Ghost, who resembled Batman but dressed all in white. In the evenings I would take out my box of crayons and sketch superheroes on colored construction paper. I created my own company, Ballistic Comics, a universe of superheroes and villains forced to do battle in the space of one page. I made advertisements announcing a new character or the release date of a new comic and taped crude sketches to my door. At the end of the month, I would have my Mom photocopy my crude works of art and then charge her twenty-five cents to read them. It was a lucrative business for a six-year-old. When I wasn’t drawing I was reading comics. 7. I went to a Catholic school, Saint Pius/Saint Leo. I had to wear a uniform: navy pants and a light blue collared shirt. When I wasn’t chasing girls on the playground or playing kickball, I was drawing superheroes. In religion class, I used to imagine the characters of the Bible as God’s superheroes and the devil’s evil minions. I created my own comic book stories of the Bible where Jesus was captured by robots and his apostles had to save him. Going to church was a brain-storming session for ideas. At the time, I was fascinated by Catholic rituals. How did Jesus turn water to wine? How did he walk on water? How did he rise from the dead? 8. Every year on Good Friday my brother and I would reenact the Stations of the Cross for my parents. The year Robin died we performed a comic book version of the Passion of Christ. My brother, dressed as Robin, with a mask over his eyes, carried a cardboard cross from his bedroom, down the carpeted steps, through a crowd of action figures, past our barking dog, Rusty. My parents looked on in horror as I emerged from the kitchen dressed as the Joker with a green-dyed wig and white painted face, laughing hysterically like Caesar Romero from the sixties Batman television show. I beat my brother repeatedly with a Styrofoam crowbar and shouted, “Death to Birdboy!” as he tried to fend off my blows. I realized now that I forced myself to be the Joker as a form of penance. In a strange way, lashing out at my brother was the first step in letting go of my guilt for Jason’s death.